There is so much of history that we are still unaware of, so many tidbits waiting patiently to be discovered. 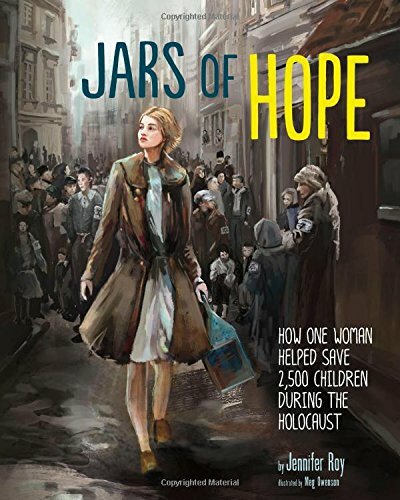 This new picture book, Jars of Hope: How One Woman Helped Save 2,500 Children During the Holocaust, is one of those tidbits. Penned by author Jennifer Roy, who co-authors the bestselling Trading Faces series with her twin sister, this book teeters between adventure, stark sadness, and daring, “almost-got-caught” moments that will keep readers on the edge of their seats. It is the story of Irena Sendler, who lived in Otwock, Poland in 1917 during the time that the treatment of Jews was becoming more deadly by the moment. Prompted by her father to believe that no one race was better than another, Irena adopted this belief and took a job as a social worker to help vaccinate the 500,000 disease-prone Jews living in the two-square-mile, barb-wired Warsaw ghetto. But once Irena understood the plight of these destitute people, she soon took on the role of rescuer. Irena and close companions hid babies in potato sacks, led young children through underground sewers, and even hid the very small inside coffins in order to help them escape the death chambers. Even after she was captured, beaten, and half-starved, Irena would not betray her cohorts and held fast to the belief that all races are equal in God’s eyes. Although Jars of Hope is a dark and tragic picture book that, Ms. Roy’s prose shines with the ultimate triumph of good over evil. Artist Meg Owenson’s illustrations are detailed and precise, and her talent is not hidden despite the fact that the colors must, by necessity, be much darker than those shared in the typical picture book. There are, however, a few minor annoyances. First, Irena’s identity is not easily ascertained. Her full name is not mentioned in the book’s title or on the opening pages, and the “curious mind that wants to know” must turn to the Source Notes at the very end in order to discover who the subject of the book really is. Next, the text size varies at unexpected places, but the reason for this discrepancy is not clear. Last, the manuscript is quite wordy for a picture book. This is understandable, seeing as how the author covers years of unspeakable horror in only a few pages; however, if you like your picture books short and to the point, this probably isn’t the book for you. Word length and design strategies aside, this is an informative and necessary read that any school library, special interest group, or parent who thirsts for history and almost forgotten tidbits would do well to obtain for their children.